Grab your light sticks and reflective vests and join us for an equinox 10K fun run under the supermoon in Chatham. We’ll be starting at Chatham Jr. Sr. High School on Crowell Road at 7:00PM on Sunday, 20 March, and just about hitting Bridge Street as the sun crosses the equatorial zenith at 7:21PM, the official start of Spring. After the run, we’ll adjourn to a local tavern to rehydrate. There’s also a 5K option for those looking for a shorter run or a nice walk. 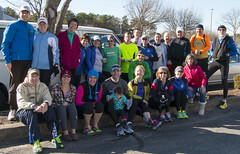 See the Chatham Harbor Run site for maps. 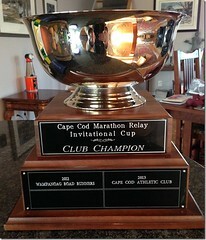 For information, contact ccac@capecodathleticclub.org. 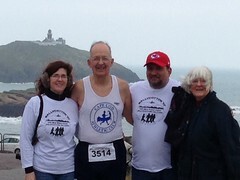 CCAC was well represented at the 7th Annual Menendez Miler 5K Run/Walk, March 12, 2011 in Key West. 138 runners and 34 runners completed the race. 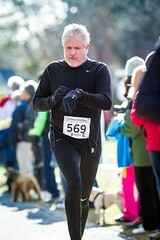 The weather was gorgeous by Cape Cod standards, high 60s with a breeze. You could tell who the locals were. They were the ones dressed in full tights, long sleeves, hats, and vests to warm up! CCAC claimed 3 medals and a plaque for the day, we were definitely "ringers" who took hardware away from the local runners. Kathleen Thomas was singled out for First Female Master with a time of 23:35,7:36 split, 2nd overall female and 24th overall, and awarded a handsome plaque indeed. Adam Ross medaled with 1st place Men 60-69 with a time of 24:04, 7:46 split, 27th overall. Mary Ellen Ross medaled as 2nd place Women, 40-49 with a time of 24:36, 7:56 split, 7th woman, and 30th overall. Of special note, a humorous moment when Mary Ellen was called up, the announcer pronounced the town "Falmouth" as "Foul Mouth", so we all got a kick of out of that, and sounded off loudly how to pronounce it. 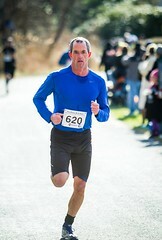 Dwight Pfundstein was 1st Men’s 50-59, 11th overall, with a time of 21:39, 6:59 split. Amazingly, the announcer could pronounce "Pfundstein" correctly, but not Falmouth!!! First race I’ve ever been to where that occurred. Take an active role in club activities! Whether you want to serve as an officer or just vote on who gets that big paycheck, come to the monthly meeting on April 6th and decide who you want to represent your interests at the club. All officer positions are up for re-election: president, vice president, treasurer, and secretary. Be at the Dennis Senior Center at 7:00PM on the 6th of April! · Tri-team clothing kit has been posted on website and is available for ordering. Final order to be submitted on 3/11/11. · Discussion about sending out postcards about membership dues currently overdue. Also discussion about contacting members and new members via email. Several ultrarunners of yesteryear were seen flashing their speed at the Hyannis Marathon Sunday whilst I picked up a few water cups at mile nine. Most used it as a good long training run for Caumsett 50K next week or the Umstead 100 in three. Also 52 is Jim Garcia,1999 Boston Charles 100K Challenge Cup champ, who ran a 2:56. Former national 50K champ Dan Verrington is 48 and turned in a 2:43, while former national mountain running champ (and Nip Muck record-holder) Dave Dunham checked in with a 2:58. There were plenty of others: Lee Dickey, who seems to race about every weekend as he approaches 60; already 60 is Bob Eckerson, as he closes in (within three now, I think) of 100 26.2s or ultras; Dream Camp pied piper Mike Brooks, high fiving me on his way through and promising a battle at the NJ 3-day; Dima Feinhaus, who paced his son to a successful debut in the marathon;local ultramen Mike McKenna, Ken Lemerise, and George Graeber.